Arguably the outdoor sports and recreation capital of Oregon, Bend was known merely as a fordable spot on the Deschutes River up until the early 1900s. 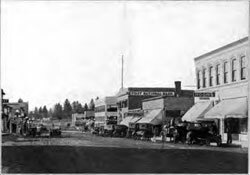 But buoyed by the success of the Pilot Butte Development Company, which first platted and sold lots, Farewell Bend, as it was known then, boasted 300 residents by 1904. In that year they voted to incorporate, and on January 4, 1905 residents held the first official meeting as an incorporated city. In addition to the aforementioned proximity to recreation opportunities, Bend is nowadays known for its excellent collection of breweries, Californian real-estate speculators, and the fine biscuits and gravy.